"I used to feel like I needed all kinds of action with other women away from home. Until I realized that I was putting my family at risk. I mean, AIDS is out there. So I looked at what I had. A faithful wife. Two great kids. I can't imagine why I even looked for a good time anywhere else. I love my family and I'm not bringing it home." "This has been a message from the U.S. Centers for Disease Control." 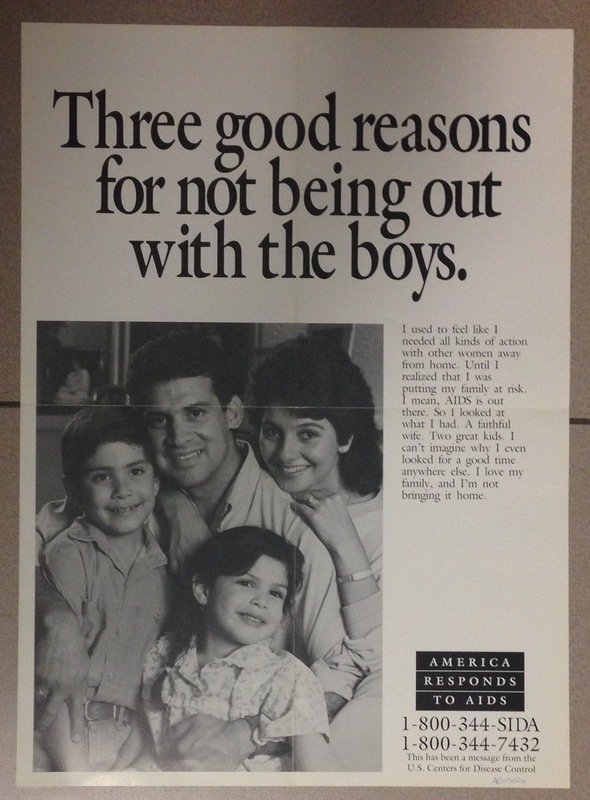 "An Hispanic man, pictured with his wife and two children, describes how his love for his family has caused him to give up behaviour that could place him at risk for AIDS." - CDC National AIDS Clearinghouse, Catalog of HIV and AIDS education and prevention materials September 1994, p. 19. Order number: P093. Pregnancy among high school students.